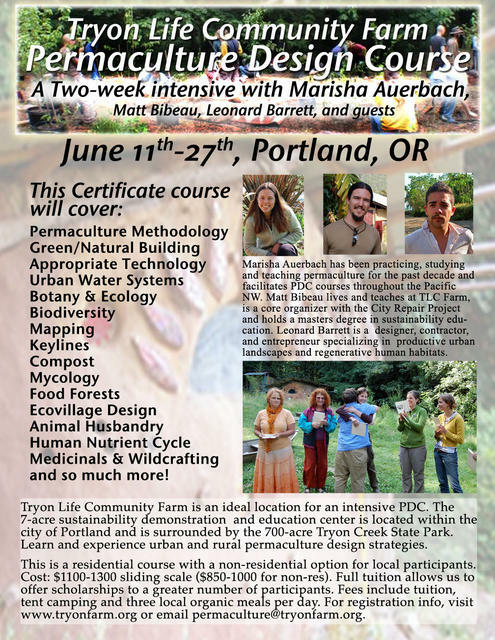 TLC Farm will be hosting a full 72-hour Permaculture Design Course this summer. This course will be a two-week intensive that will meet from June 11th to 27th. The course can be taken as residential, or not. The fee for the non-residential option is $1000 - 850 sliding scale. The fee for the residential option is $1300 -1100. Limited work trade may be available. More about the course: A Permaculture Design Course explores sustainable human habitation. We begin with the ethics and principles of permaculture which support a philosophical reverence for life and provide a framework for making healthy choices. The objective of a Permaculture Design Course is to provide a comprehensive overview of sustainable futures, based on permaculture philosophy, techniques, and strategies that one could incorporate into their everyday life, or enhance their career. These courses provide hands-on experience. The intention is to facilitate a systems approach to thinking about different issues, encouraging care for the earth and its inhabitants as a diverse community. Topics Include: * Permaculture Philosophy & Ethics * Permaculture Principles * Concepts and Themes in Design * Permaculture methodology * Pattern Understanding * Reading the Landscape * Climatic Factors * Edible Landscaping & Organic Gardening * Trees and their Energy Transactions, Tree Crops * Water, Water Harvesting * Soils & Composting * Earthworking and Earth Resources * Natural Building * Animal Husbandry * Urban Permaculture * Appropriate Technology * Intentional Communities * Sustainable Forestry & Agroforestry * Ethnobotany/ethnoecology * Plant Propagation * Ecosystem & Native Plant Restoration * Mycology * Permaculture Networks * Bioregionalism * Local Economics * Ecological Design * Ecovillages * And more..
For more information about this course, please email permaculture@tryonfarm.org or call Matt Bibeau at 503-245-3847. Instructor Bios: Marisha Auerbach will be the lead instructor of the course. Marisha has been practicing, studying, and teaching permaculture in the Pacific Northwest for the past decade. She encourages sustainable futures through sharing knowledge with others on a variety of topics including: permaculture, polyculture gardening, seed saving, flower and gem essences, local economics, community building, ethnobotany, herbalism, edible landscape design, and organic gardening among others. Matt Bibeau is an active resident at TLC Farm and received his Master's Degree in Education with a focus on Leadership in Ecology, Culture & Learning from PSU in 2008 and is also a certified Permaculture Designer and Teacher. 3. Do you have any medical conditions or physical limitations that we should know about? (TLC Farm is not currently an ADA-accessible site, so any alter-abled students should let us know about their needs and concerns). 4. Are you applying for the residential (camping) or non-residential (commuting) option? 5. How did you hear about the course?